I enjoyed this book. The author, Richard Wolfson, takes a novel approach to explaining the Special Theory. Rather than starting his account with clocks moving fast relative to the observer, which seems to be the most common way of introducing lay people to this area of physics, instead he writes first of Newton's laws of motion, explaining that these laws are valid in any uniformly moving frame of reference, quoting ideas first postulated by Galileo. Then he explains how James Clerk Maxwell formulated his famous equations and calculated that electromagnetic waves travel at 186,000 miles per second (c), the same speed as already established for light - thus Maxwell drew the inescapable conclusion that light is an electromagnetic wave. However, this revelation raised the question as to what the speed of light was relative to. Astronomical observations showed that it didn't depend on the motion of its source so, by analogy with sound waves, where the speed is relative to the medium in which they are carried (ie, air), the belief at the time was that the speed of light was relative to a mysterious ether that pervaded the entire universe. But if you're moving through that ether, then the speed of light relative to you won't be c, in the same way that the speed of sound waves measured by someone moving through air is different from the 700 miles per hour speed of sound relative to air. If it turned out that light only travelled at c in a frame of reference that was at rest relative to the ether then observers moving through the ether will measure, not c, but some other speed for that of light relative to themselves. In that case, Maxwell's equations would only be valid in a frame of reference at rest with respect to the ether - unlike Newton's laws of motion. In other words, while the concept of absolute rest is meaningless for Newton's mechanics, it would appear to have meaning for electromagnetism. This asymmetry in basic laws was a serious dichotomy that baffled physicists of the time.Of course, as we all know, repeated efforts in the late 19th century to find this ether failed, with the killer blow being dealt by the famous Michelson-Morley experiment of 1887. A crisis faced physics - but step forward 26 year old Albert Einstein with his Special Theory of Relativity, published in 1905. Interestingly, his paper was entitled “On the Electrodynamics of Moving Bodies”, underpinning the essential issue of making sense of Maxwell's equations. Einstein concluded that the laws of physics are the same in all uniformly moving reference frames and that the speed of light is the same for all uniformly moving frames of reference.It is from this position that Wolfson starts to elaborate the consequences of Special Relativity, discussing time dilation, length contraction, simultaneity, energy/mass equivalence, causality and spacetime diagrams. He does this using an approach that provides the reader with insights into the deeper meanings of relativity. It was a challenging read at time but Wolfson patiently makes his case, frequently recapping key points and often reminding the reader of the significance of what he refers to as the Principle of Relativity - all this is done with the bare minimum of maths.Roughly speaking, two-thirds of the book is occupied with the lead up to the Special Theory and to the discussion of that theory; the final third of the book lends itself to a discussion of General Relativity, covering also black holes, gravitational time dilation, gravitational lensing and gravitational waves, and touching on quantum gravity, string theory, Hawking radiation, cosmological expansion and inflation, dark energy and dark matter, multiverses and parallel universes and wormholes. By his own admission, his treatment of General Relativity is more superficial than that of the Special theory, simply because an in-depth knowledge of advanced maths is needed to really understand General Relativity.Something I didn't fully follow was Wolfson's assertion that all the laws of physics, including Special Relativity, work in both a truly uniformly moving reference frame and also in a "free-float" reference frame (such as experienced in, say, the International Space Station). He claims that it was on this basis that Einstein proposed the idea of light being bent by gravity. However, he then goes on to say that when Einstein developed his General theory he realised that light is bent by twice the amount he had originally calculated, something confirmed by Eddington during a solar eclipse. In that case it seems to me that this disproves the idea of physics being the same in uniform motion and free-float frames of reference. But this may be me misunderstanding the argument.Overall, it must be said that Wolfson's style of writing may not suit everyone but for me it was ideal. He repeatedly restates his main arguments so as to ensure that no reader is left behind and everyone understands the idea - there's little risk of anyone not following most of his account. Warning: This review contains complaints about a lack of higher mathematics. If that is going to squick you, flee now.I picked this up because it's been over five years since I studied physics in an organized fashion, and it's a lot like a second language in that you use it or you lose it. So I started at the beginning again. This book is good – very good, even, and I recommend it highly to anyone with an ounce of curiosity about, you know, the cosmos and reality and stuff.But because it's so foundational, it works almost entirely through example by analogy and simile. And I'm kind of weird, so I've always found physics by analogy (you're in an elevator in orbit and you drop a rubber ball!) to be counter-productive. The analogy sort of . . . gets in the way for me so I don't get at the fundamental truth. Which is why I didn't grock physics until I got through calculus and they could explain it to me that way. At which point, vistas opened up like magic. So it's a really good book – lucid and logical and careful. And it's really nicely aware of how understanding General Relativity in particular is a trick of consciousness. It doesn't matter how much you know if you can't reorder your conceptions of 'true' and 'real.' Which is awesome, it just wasn't the book for my consciousness. I don't know if this book can take the credit for this, but I had a massive ahhh ha moment while reading it. I finally get gravity! Finally, finally, finally! It is not a force! It is only a warping of space-time. How many times have we heard this but for some reason I couldn't visualize it as anything but a force and I finally get it! Halleluiah. The feeling of understanding is amazing. I think it was just an accumulation of lots of material on the subject that brought me to this point. So I am unsure if it is fair to attribute this all to this specific book but who cares? I got the concept. That is the most exciting and engaging moment I have had in quite some time. I think the analogies provided in this book are not just the standard ones (though of course the famous twin paradox is taken on). The Muon example was wonderful, and I really thought some of these thought experiments were well formulated. This is not a heavy read, so if you are looking for something more substantial this may not fit the bill. Though because of its format it may help you make some connections, and that is the most important thing that can happen when learning something. It's a great feeling! By far the best work on relativity I have ever read.Richard explains the subject lucidly and in great detail. He is able to explain the essence of relativity without using any complicated mathematics (admittedly one of my weaker points). He also does a wonderful job explaining some of the history around the great minds and ideas that lead to the discovery of relativity. This book was my choice for our book club at work and when we met to discuss it the consensus was nearly unanimous – it was the hardest book we have read by far, but also one of the best, most interesting, and most thought-provoking. Reading a book like this really highlighted the difference between reading literature for pure pleasure and reading non-fiction to learn complex concepts. Both can be rewarding experiences but they use completely different parts of our brains.Mark thought this was the best book we read so far, and I liked this book so much that after returning my borrowed copy to the library I purchased a copy for my bookshelf. I will freely admit that I had to re-read several sections of the book to allow the concepts to make sense.The topic of the book is Einstein’s Special Theory of Relativity, which is difficult for most of us to comprehend because it deals with physical phenomenon that manifest themselves most observably at speeds we have never experienced — many thousands of miles per second. Because nearly everything we know and experience on Earth travels far less than even a single mile per second (3,600 miles per hour), we simply don’t experience the effects of relativity, and therefore find them difficult to comprehend.In many ways, trying to teach humans about relativity is similar to explaining to snails how race cars zooming around a track need a very steep banked wall during the turns, to counterbalance centripetal acceleration. Any human who has ever watched a NASCAR race (or exited a highway at high speed) understand this principal intuitively.But most snails never would likely be completely puzzled by the concepts of inertia and acceleration and banked curves because any snail that moves faster than one foot per minute is a likely candidate for the land speed record for snails. And centripetal forces at such small speeds are simply not noticeable, regardless of how smart the snails may be.And so it is for us humans who, as Adam pointed out in our book club discussion, think that “space” and “time” are two completely different concepts, when the reality of the universe is that space and time are both manifestations of a single concept called spacetime. In his book, Wolfson does an excellent job of explaining how Einstein built on the work of Newton and others to eventually realize that time is not a universal constant but rather is inextricably intertwined with space.The classic analogy used to explain how massive objects curve spacetime (and cause the perception of gravity) is by causing an indentation on a flat surface, such as in this picture of the sun. The analogy is incomplete, however, because spacetime is four dimensional and we lack the tools to properly represent four dimensions in a two-dimensional medium such as a book or webpage. (We also learn that gravity isn’t a force like magnetism but rather is a simple consequence of the topology of spacetime being curved and distorted by massive objects. )What this means as a practical matter is that when someone travels at thousands of miles per second, time slows down. Not from the perception standpoint, as in “I’m bored this class is taking forever,” but in the real physical tangible sense that the passage of time itself changes and slows when someone (or an object) is moving near the speed of light of 186,000 miles per second.This concept is mind-boggling when you understand that for a person moving near the speed of light (relative to us on Earth) their clock is not “running slow.” To an observer traveling at three quarters of the speed of light, time seems to “run” normally. But time is “passing” for him at a much slower rate than for everyone else on Earth.Wolfson does a very nice job of expanding on Einstein’s famous explanation about what would happen to a pair of identical twins when one took a trip on a spaceship traveling at near the speed of light, to another star, and then returned years later: From the perspective of the space-traveling twin, only five years have passed. But when he returned home he would find that his brother had experienced and aged twenty years because time itself is not a constant – the speed at which time “ticks” varies depending on one’s speed relative to another. Both twins experience time normally in their local space but their entire frame of reference experiences time differently.My own analogy is to think of two boats on an ocean, hundreds of miles apart. Both boats have their motors on and are moving northeast at 5 miles per hours, but one boat is floating in the middle of the Gulf Stream, which is also moving northeast at 5 miles per hour.As I said, this concept is mind-boggling, because we on Earth all experience time moving at the exact same speed “through time” because we are all essentially at rest when compared to the blazingly fast speed of light.Wolfson also does a nice job of explaining how, because space (distance) and time are not separate principals but rather are both part of “spacetime,” it is equally valid to say that “distances” change as it is to say that “time” changes. Wolfson is a patient, methodical writer who does an admiral job of explaining one of the most astonishing concepts in science without resorting to high level math or mumbo jumbo. In terms of other feedback and thoughts, Erica said she likes these kinds of books because it reminds her how little we know (as a species) and how much learning is ahead for us. We tend to think of ourselves as modern and advanced as compared to those ignorant fools a thousand years ago who knew nothing of cars or electricity or even basic medicine. But I have little doubt that people 500 years from now will look back at our times and shake their heads at how primitive and confused we were.The book also discussed how black holes are formed and behave. Kate loved that part, especially thinking about how a teaspoon of a black hole could weigh trillions of tons. (Be sure to use two hands to hold it! )Related to this concept, we discussed recent data collected by astrophysicists that calls into question the current belief that before our universe came into existence there was pure nothingness. No time, no space, no nothing. Within the last few weeks a pair of prominent researchers may have found proof of echoes from a “big crunch” that happened before the big bang that created everything we know. They theorize that “our universe may ‘be but one aeon in a (perhaps unending) succession of such aeons.’ What we think of as our ‘universe’ may simply be one link in a chain of universes, each beginning with a big bang and ending in a way that sends detectable gravitational waves into the next universe.” (Source, NYT. )Adam really liked the idea of our entire universe recycling – starting with a big bang, billions of years of expansion and life and adventure, followed by a huge crunch as ever last stitch of spacetime and all matter and energy crunch back into a singularity. . . which causes another big bang and so on forever.Mark pointed out that it is nearly impossible for us humans to fathom there being a time before time … a time where there is no time. He is certainly right, and we find that concept nearly impossible to fathom because time is such a constant in my life. But it does appear that time is neither constant nor universal, except when waiting for a pot of water to boil or a crying baby to fall asleep. This is a frustrating book. The author's attempt at simplification fails in fundamental ways. He writes that Einstein's theory of relativity "is based on the simple statement that motion doesn't matter"; the theory is "in its barest essence, just the simple statement that regardless of one's state of motion the laws of physics are the same." Wolfson also adds that by motion he means "uniform motion." Such statements are repeated, as if self-explanatory, but he doesn't clarify why the state of motion itself is an issue for Einstein. Things move. So what? Then, on the next page, the author varies himself somewhat by writing that "the theory of relativity is summarized in a single, simple English sentence: The laws of physics are the same for all. This statement - called the Principle of Relativity - is so obvious that you need read no further...." But, to the reader, if the laws of physics are not the same for all, then why are they called laws? If the theory of relativity (special, general, both?) is the same for all, why is it then called "relative" when the theory is really about universality?Later, Wolfson explains that Einstein himself never used "relativity" to explain his theory; Einstein preferred "theory of invariance." Helpfully, Wolfson states that relativity took hold because motion of one event/object is relative to the motion of another event/object, and not to any fixed reference point. He goes on to explain that the theory is "ultimately about the absence of any formal reference frame...." Everything is in motion and there's no fixed reference point in space or time. That seems much clearer than the first 80 pages, but now he states that the invariance of the speed of light is a consequence of the theory of relativity, but doesn't explain how these two are connected in a cause - effect sort of way. Given these frustrations, I did not try to follow his discussion on how time slows or time travel.Wolfson doesn't get better on the general theory (gravity). Along with others, he uses the term free fall to describe an object in motion and later adds a friendly amendment by stating that such motion is a free float, which "simply means that the only influence acting is gravity." How is an object free if it's being acted upon by something else? If gravity is always acting on an object, then is there such a thing as free motion a la Newton? Or, did Newton have it right when one of his laws states that there is free motion UNLESS an object is acted upon? Wolfson writes that the way we think of gravity is not real "because it disappears in some reference frames" (i.e., any "free float frame"). That seems like he's saying that air is not real because it doesn't exist on the moon. We understand from Einstein that objects follow the curved lines of space and that gravity for Einstein was, therefore, not a force (pulling objects instaneously from a distance and leaving open for now about why we're looking for gravitons), but Wolfson states that "Gravity is no more and no less than the curved geometry of spacetime." The "no more, no less" statement is interesting as it does not explain why spacetime is curved at all. What creates the geometry of spacetime? Wolfson answers that question a few pages later and uses Wheeler-like words (without attribution) by saying that "matter act [sic?] on spacetime, giving it curvature" just as "curved spacetime acts back on matter, telling it how to behave." In other words, it's "the presence of matter that curves spacetime." Isn't that - heavy mass - gravitational "pull"? We know from the experiment on Einstein's theory that light bends, and it seems clear enough that the sun's mass, if it doesn't pull light directly, does pull space downward (i.e., "the sun's gravity deflects the starlight"), toward the sun, thereby warping it. If it's not gravity that has this effect on space, what is it and isn't it a "force"? And, if Wolfson says that gravity and spacetime are the same thing (curvature), what does curvature of spacetime have to do with the weight I feel on Earth or Newton's apple? Subsequently, Wolfson seems to lapse into Newtonian gravity language when he talks about large masses as attracting gravitational forces.On a positive note, the author's two page discussion of why the theory of general realativity and quantum theory confict is the best I've come across. General relativity is a "continuous" theory in the sense that large phenomena manifest themselves seamlessly (like flowing water) whereas at the quantum level, phenomena manifest themselves in quantum chunks. Yet, overall, the book falls short. Its subtitle is "Relativity Demystified," but the more appropriate subtitle might be "Relativity Mystified". There are other books out there that do a better job on Einstein for the general reader. Admittedly, those more well versed in physics may not have the same reactions to this book. Not very engaging writing. I was bored after a while. And this is my study field mind you. Does precisely what it says it does, and does it well. Not only does the author make an incredibly complex and potentially baffling subject easy to digest, he makes it very entertaining with easy to understand examples and real-world applications. Best of all, there's absolutely no complex mathematics involved. The only number crunching in the main body of the book is perfectly understandable to anyone with high school maths (even if high school was rather a while ago and you hated maths, as in my case), though the more detailed stuff is provided at the back along with suggested further reading. In all honesty, even the "serious" maths isn't that difficult to grasp, and I struggle to add up my grocery bill before I get to the check-out.Anybody with a casual interest in science should read this, if only to see how well popular science writing can be done. This book is extremely intriguing to the reader whom loves math and science. 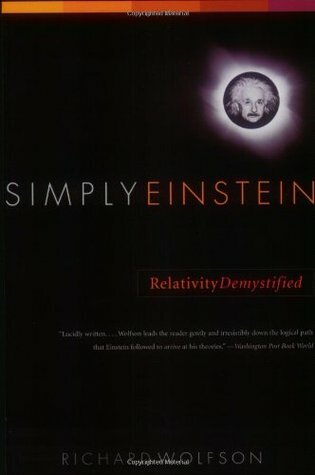 The book explains Einstein's theory of relativity in the simple mathematical principles. The physics behind these ideas push the reader to research further into what they read by providing the spark for the fire of curiosity. This gives me the information necessary to pursue the career I want to in aerospace engineering because of the fields dependence in physics. The numerous theories explained help give the reader a better understanding how the universe works which is necessary in the STEM fields. One of the best books I have read on this subject. Can't say I understood every word, but it does bring a great understanding go Einstein's theories and the known science at the time that led him to his thinking. Hugely readable. You will just not believe what the universe is like. Highly recommended read. A very short read, and rather entertaining. It starts with some historical overview of the ideas and goes into the subject of relativity using simple, lucid explanations. It doesn't really go into the heavy mathematics, so if you are new to the subject it is quite good.It explains how people thought of the Ether and other such things so it was pretty interesting for all of that. An excellent companion to Wolfson's course, "Einstein's Relativity and the Quantum Revolution: Modern Physics for Non-Scientists, 2nd Edition" available from "The Teaching Company" (http://www.teach12.com/ttcx/CourseDes...). His teaching is as clear as his writing. Definitely the most intelligible book I've read on the birth of relativity (I still don't get it but that's my problem, not his).